The first time I spoke with my client Wilma, I had no idea what she did. Her world was a complete mystery. In our discovery interview I smiled and nodded along like everything she was saying made perfect sense. Like “strategic planning” and “executive coaching” were all very routine in my world. But I pressed on. I talked to other ICF coaches, mined my contacts in the corporate world, and read dozens of her competitors’ sites. And I’m so glad I did. The website for Wilma’s consulting firm Transcend Management is top of my portfolio. It was WAY out of my comfort zone, and the results were fantastic. But there was an even more important side effect to working with Wilma. Wilma completely schooled me with her commitment to writing a weekly newsletter. I get it every week. She’s the only client I have who’s actually committed and delivered on a weekly newsletter. Dear business owner, I know you suffer from newsletter fatigue. You know you gotta, but you just don’t wanna. If you’re on the fence about it, consider this: The Direct Marketing Association calculated that email marketing has an ROI of 4300%. 4300%! It beats out TV, radio and all forms of social media put together. But enough with the why. You know the why. I enlisted Wilma to teach us the how. Wilma uses a virtual assistant. Wilma’s assistant is a student in her final year of law school in the UK. She handles all of the technical stuff – uploading Wilma’s blog to WordPress, setting up and scheduling her newsletter, adding links, social sharing, etc., leaving Wilma free to spend her time where she can create the most value. Since Wilma likes to do her writing at night, the time difference means that her assistant gets an outline first thing in the morning, which she can turn into a first draft. I too partner with a VA for client newsletters because their hourly rate is lower than mine. The newsletter gets out faster and the client saves money. Everybody wins. Some clients aren’t comfortable sharing around their login information, or worry that an unsupervised VA will spend hours on simple task. It’s a process. You won’t know until you test a few options. Wilma and her VA share a master Word doc. Wilma gets her newsletter and blog done with the program that’s most comfortable for her: Word. They pass it back and forth via email for 3 or 4 rounds of editing. I use google docs for myself and for clients. This way we can simultaneously edit documents, so no one’s edits ever slip through the cracks. They maintain an editorial calendar. Keeping an editorial calendar means you never find yourself staring at a blinking cursor waiting for the muse. I keep a virtual notebook that syncs with all my devices, and I sit up and pay attention when an idea comes to me. Your muse will visit you more often if you honour her and listen up when she’s trying to tell you something. For more on this, read Big Magic by Liz Gilbert. She dedicates time to it every week. She gets great feedback on it all the time. Clients forward it to their friends in the industry or share it with their team. She can’t track everyone, but there’s enough feedback to know it’s reaching its destination. I can crack out a short blog post and newsletter in under 2 hours. (This one took 3, but it’s longer than usual.) For clients I budget an extra hour, though the first few always take longer since we’re still ironing out the content and style. 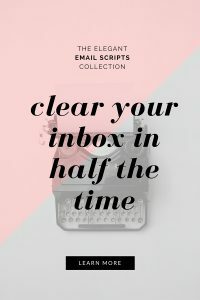 A good VA can usually upload the content in a half hour, but between answering emails and orchestrating the whole business, it’ll probably cost an hour of her time. Wilma tracks open rates and click-throughs. Rather than Googling “best time to send email” (I’m SO guilty of this), Wilma tapped into her data to figure out what was best for HER clients. She experimented with different days and times, tracking the results with Mailchimp and Google Analytics. Tuesday morning at 7am gets her the highest open rates, and views slowly drop off throughout the week. She avoids sending late in the week or before a long weekend, since she knows the drop off rate will be much steeper. If you know who your ideal client is – and I hope you do – you have a pretty good idea what her week looks like and what would be the best time to reach her. Is she a stay-at-home mom who checks her email once or twice a week at nap time? Is she a corporate go-getter who reads emails on the treadmill at 6am? If you don’t know, ask. And then test. Always be testing. She doesn’t fret about 100% original, never-been-done-before content. It’s not WHAT you write about so much as HOW you write about it. So what if it’s been done before. It’s never been done in your voice. She knows her value. And she’s not afraid to broadcast it. Wilma’s newsletter arrives in my inbox regularly. It’s stylish, and it always has a link back to her site. Wilma is doing the thing we all know we’re supposed to do. I don’t know about you, but I’m making it my goal to be more like Wilma. What’s keeping you from consistently sending out a quality newsletter? List your top 3 excuses, and we’ll go ahead and bust them together.